Unfortunately we can't all be lucky enough to get tickets for Centre Court. So instead, you could show your support at one of these free London screenings. A few strawberries and a glass of fizz, and you could be on Centre Court itself. 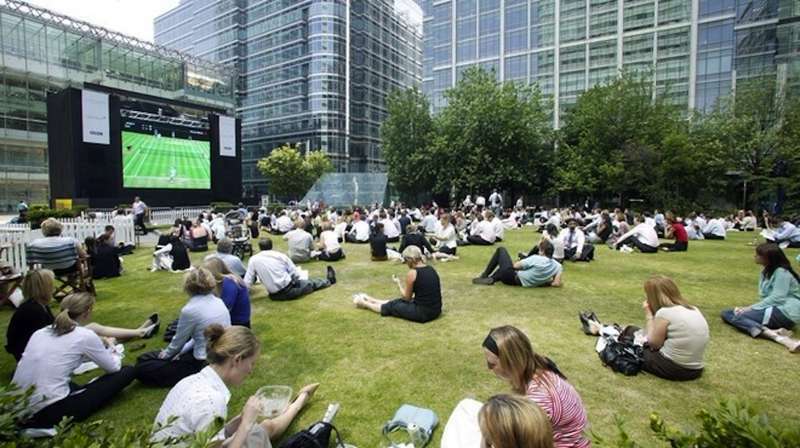 As part of the collective Great British Summer event, you can enjoy all the tennis action live and completely free at any one of these outdoor screenings in central London. Refreshments are on offer, but if you get peckish, check out the Wimbledon meal deals at the neighbouring restaurants. The huge 14ft screen at Duke of York Square is the next best thing to courtside tickets. There's strawberries and cream on offer, plus you can treat yourself to a champagne tipple from the Pommery champagne tent. Catch the finals and men’s semi-finals at this gorgeous spot. Partridges restaurant nearby are also offering an array of summer specials for the occasion. You're invited to pull up a pew right in the centre of King's Cross. The screenings start take place canalside in Granary Square and are part of the Everyman Summer Love Film Festival. Deck chairs are provided (be sure to arrive early to bag one), as well as strawberries, refreshments and KERB street food. The glorious green space that hosts the British Summer Time Festival is opening its doors for free to the public for a limited period (Monday July 9th - Thursday 12th July 2018), with freebie screenings of the tennis and other events such as outdoor cinema and food markets. Enjoy some weekday screenings here. The Big Screen returns once again to this multi-purpose plaza in NW1. Head there for open-air viewings, complete with deck chairs and a beach house themed pop-up bar. Not to mention plenty of eateries surrounding the piazza such as Drake and Morgan's The Refinery. Sadly Murray won't be playing in this year's competition, but there's still plenty to look forward to!